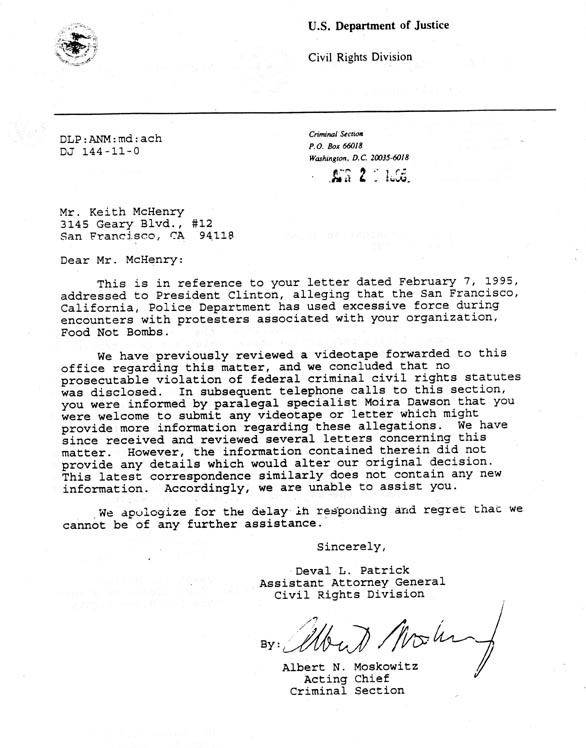 "This is in reference to your letter dated February 7, 1995 addressed to President Clinton, alleging that the San Francisco, California, Police Department has used excessive force during encounters with protesters associated with your organization, Food Not Bombs." Howard Zinn suggested we send copies of wiretap memos, other internal police documents and videos of the police beating Food Not Bombs volunteers to Clinton's Justice Department. As a result of this letter from Clinton's Civil Rights Division, the United Nations and Amnesty International agreed to help with our case.